Renovated air conditioned studio, less than 50m from La Pineda's beach & centre. Air conditioning and parking included - terrace - new furnishing - 2/4 people. Air conditioned studio in a little family residence, ideally located only one minute walk from La Pineda's long fine sand beach and in the very centre of the seaside resort. This is a functional property, recently renovated to accommodate up to 4 people, which counts with a large main room with an equipped open-plan kitchen, as well as a modern bathroom with shower and, from the living room, there's direct way out, thanks to a wide picture window, to a cute little terrace, covered and furnished to enjoy outdoor meals, with a table and 4 chairs. This is a very well maintained apartment, comfortably furnished with a fold-away double bed with a new Memory foam mattress and fold-away bunk beds. On the third floor with elevator in a peaceful family residence, there is a private parking spot included in the residence, reachable with gate and remote control. In the resort's centre yet in a quiet environment, it has a privileged situation as less than 50 metres from La Pineda's long fine sand beach with lifeguard and fitted out with beach huts, playgroundsm showers, etc …. , from the pedestrian maritime promenade and from the centre where you'll find all kinds of facilities, services and activities such as supermarkets, bakeries, chemists, many restaurants, bars, chill-out bars in the sand, shops, game rooms, etc. The famous Aquopolis water park with its dolphin show is only 5 minutes walk from the apartment and closeby there are bus stops with regular 24-24 lines to the famous Port Aventura theme park, to Salou's resort as to the nearby cities of Tarragona, Reus and Barcelona. This is an economic property, ideal for little families or pairs wishing to spend relaxing holidays by the beach. Catalonia applies a holiday tax, included in the price for this property. 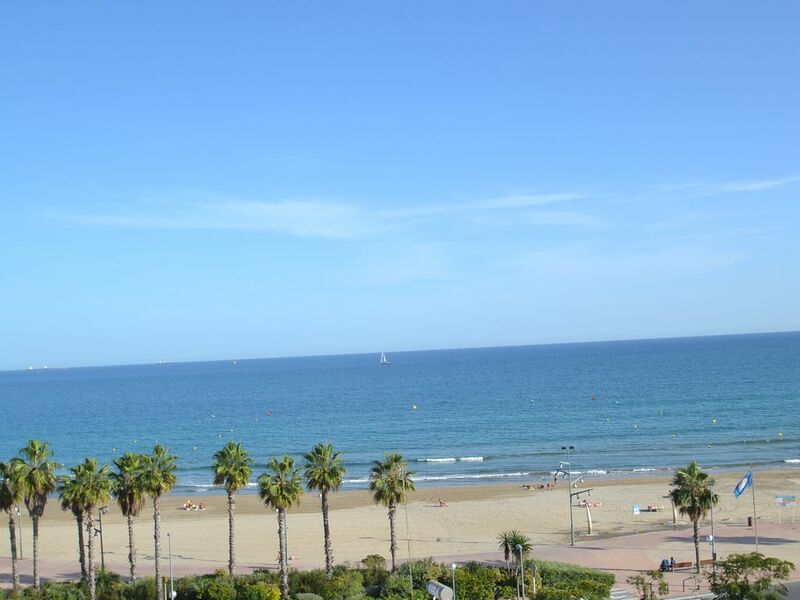 La Pineda is a seaside resort over Costa Dorada, which stands 100 kms South from Barcelona, 5 kms South from Tarragona with its rich cultural patrimony and UNESCO classification (Roman ruins), 2 kms North from Salou and close to the famous Port Aventura theme park. La Pineda extends all the way by a long fine sand beach, appreciated by families for its crystal water and soft slope, ideal for young children; it is lined by a beautiful maritime promenade, for walks and rides, fitted out with palm trees, high pine trees, children playgrounds, shops and pretty fountains. The seaside resort is favourable to family tourism as it offers activities for people of all age including the Aquopolis water park with its dolphin show, the modern Aquum Spa and Thalasso centre, sports and entertainment activities on the beach, many tapas bars, chill-out cafes, ice-cream makers, shops of all sorts, children playgrounds, musical bars, as well as the big Pacha Nightclub. Cap Salou has the most beautiful beaches and creeks over Salou, all of them connected to one another and to the resort's animated centre thanks to a pedestrian footbridge which was fitted out a couple of years ago and runs all along the coast. World Vacances Plus is a booking centre between individuals, created in 1998 and installed here on the spot, in Salou. We are here to help you with finding a holiday rental which corresponds exactly to what you're looking for, depending on your enquiry criteria, expectations and needs, and follow you through all the steps of your booking, in English, until key collection; for this property, it will take place directly down the residence with the property's owner who is a very kind and caring person - you'll previously receive access maps and phone numbers to reach them. Being here on the spot, we personally know each of our properties and their owners and can therefore perfectly answer all your questions. Privileged situation, less than 50 metres from La Pineda's long fine sand beach with a beautiful maritime promenade, in the very centre of the resort with all kinds of facilities and activities within hand reach. Property standing in a quiet environment, economic and comfotable which provides the possibility of an excellent and relaxing stay, to enjoy the many activities available on site. - Functional apartment with the air conditioning and a parking spot included. - No need to use your car during your stay. - Furnishing renewed in 2017with a double fold-away bed (brand new Memory Foam mattress). - Ideally located, a few minutes walk only from the beach as well as from all kinds of facilities, leisure activities and from the Aquopolis water park. - Excellent value for money. - Very well maintained property with caring owners. - A few minutes from Port Aventura, by car or bus. There is a complete recently renovated bathroom with shower, glazing door and hanger. The air conditioning, included in the property rental, is installed in the main room, just below the window. There is a washing-machine in the kitchen. There is a private outdoor numbered parking spot in the residence, accessible with a gate and remote control. Main room with open-plan kitchen, 1 sofa, a fold-away double bed and fold-away bunk beds, air conditioning, TV, ceiling fan and way out to the terrace. Open-plan kitchen with a bar leading to the living room. Living room with American bar and 2 chairs. Pretty furnished terrace with table, chairs. Residence in the very centre of La Pineda although it is not positioned towards the street. Private access to get to the property so that there is no traffic outside the residence. A few metres from a supermarket, bakeries, cafés, etc... Port Aventura and Ferrari Land are only a few minutes from there, by car or by bus. It is much advised to visit the beautiful cities of Tarragona (UNESCO patrimony with its Roman ruins) and Reus (Gaudi Museum), closeby. "L'appartement est très propre et agréable, très fonctionnel, très bien situé. Le seul petit défaut est le manque d'ustensiles dans la cuisine (par exemple pas de saladier, ni de bols et tasses), ce qui n'enlève rien à notre satisfaction. De plus, le propriétaire est très sympathique." "Super propre, studio coquet très bien équipé,très proche de la mer et de tous commerces nous avons passé un super séjour trop court propriétaire très sympathique." By car: 270 kms from the French border - exit 35 from the AP7 highway - Salou. By train: 5 kms from Salou's and / or Vila Seca's train stations and 11 kms from Tarragona's station. By plane: 12,3kms from Reus' airport and 96 kms from Barcelona's airport. Hints and tips will all be sent to you in English before your arrival so that you can organize your trip and stay. La Pineda is a seaside resort suitable for families, it is 100 Km from Barcelona, 2Km from Salou and 5Km from Tarragona, a place known for its cultural patrimony. La Pineda extends all along a beautiful fine sand beach with a beautiful maritime promenade lined with high pine trees. It is much appreciated by families from all around the world as it offers many activities for all age range : the Aquopolis water park with dolphin show, the Aquum mpdern Spa centre, sports and game activities on the beach, many tapas restaurants, ice-cream makers, shops and playgrounds, chill-out music bars, and the big Pacha nightclub. Only 5 minutes from La Pineda stand the famous Port Aventura / Ferrari Land theme parks.